What’s that you say? Another Pre-Hab video? INDEED! Many skaters ask me for tips on how to gain more agility as a skater. Well, friends – stability is a big part of your answer. (Other parts include leg strength, core strength, and ninja skills). It’s also a big part of avoiding injuries. That’s what a Pre-hab is – something we do ahead of time to prevent us from having to do “RE-hab” afterwards because we’re injured. The team that wins at Championships is the team that is healthy on bout day, and stays out of the box. (You can tweet that… you’re welcome!). So please take this stability training stuff very seriously! Imagine your leg is a tree trunk. It’s awesome. It’s real big. It holds the rest of you (your branches) up! But what’s holding IT up when a gust of wind comes along? The roots! Your stabilising muscles are like your roots – they’re going to hold you up when a big bad blocker comes to try to knock you down. I’m going to admit right here that that was a pretty terrible analogy, but I think this video and the advice within are really good, so bear with me and have a watch! As I mentioned in the video, athletes from many other dynamic sports do these kinds of exercises as part of their normal routines. Hockey, soccer, football, skiing, tennis – anything with lateral movement and unpredictable conditions. 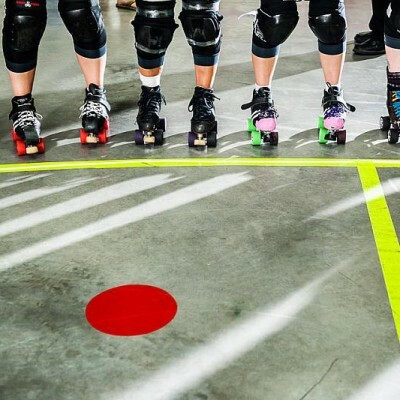 Roller derby EMBODIES lateral movement and unpredictable conditions, not to mention the fact that we are out there rolling around on a very unstable foot base. So it’s extra important that we pay attention to this element of our training. In the video I show a few really cool but simple exercises using a “slosh pipe” – my new favourite training aid! You should definitely make one. 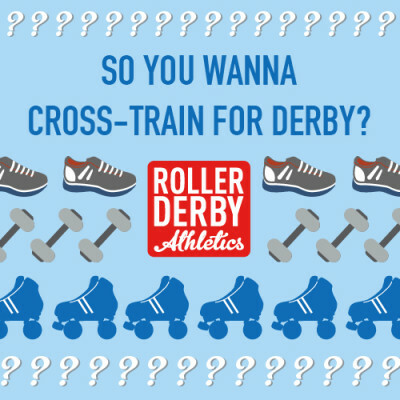 You could even make one for your league, and leave it at your training space for people to practice with before/after practice! I’ve made a whole separate video on how to build a slosh pipe. I’d love to hear from you – what stability exercises do YOU do? Is there a cool exercise that I have missed? Leave a comment below and tell me what it is! I made myself two kinds of stability boards. One is sort of like a Bosu ball but with a smaller, harder ball on the bottom or the board. The other is an old skate board with the wheels and trucks removed and a 2 liter pop bottle (one of the ones with a uniform shape) that had been filled with water and then taped with duct tape. I do all sort of exercises on them but will not start doing some stability with my eyes closed as well as adding a slosh pipe. Thanks. Claire – that is RAD! Pictures?! I love the DIY gym equipment! Great post! I love the excercises and the concept. After watching the video, I realized that I have been doing a similar thing (although not as intentionally as I will now) by just raising my heel all the way up in many of my regular exercises. So like, instead of doing a regular squat/burpee/lunge, I’ll do one with my heels raised all the way up, sort of like a releve position. By shrinking your base, you add instability. Nice one, Ice. I know what you mean – those always make my lower leg shake! Good call – must add some of those in to the routines!! For exemple, I will do the “Tree Pose”, “Extended Hand-To-Big-Toe Pose”, etc. Thanks so much for all of your videos, they are great! I am a little confused about the baseball pitcher with the 9 to 3 – are you just going to the inside or the outside of the foot and then with the opposite hand? Just wanted to clarify. I go all the way in a semi-circle from 9 to 3, and back to 9, with each hand (I don’t switch hands at 12 o’clock). Hopefully that clarifies!